Many of my past blogs had the same theme. That theme was “Baseball follows me where ever I go.” It was three years ago when I was meeting my new biostatistics class at Quinnipiac University that baseball did follow me into my classroom. Reading from my new class list I came across the name Dale Long. The name Dale Long belonged to a Major League first baseman in 1951 and 1955-1963. Clearly, this Dale Long could not be the ballplayer I watched. When Dale Long the student raised his hand acknowledging his name I of course had to ask the question: Are you related to the Dale Long that played baseball? I am sure he was shocked that his Biostatistics Professor would have known about Dale Long the baseball player who played over 50 years ago. His answer was Dale Long was his grandfather. Dale Long was a Major League first baseman. He was 6’ 4” and weighed 210 pounds. He played most of his years with the Pirates, Cubs, and ended his career with the Yankees. For his 10 year career he had a BA of 267 with 132 home runs and 467 RBIs. Yes, not awesome numbers. So you might ask the question: Why did I remember Dale Long? There are two reasons. First being a Yankee fan, I watched him play in 1962 and 1963. 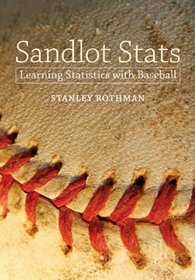 The second reason is the connection between Dale Long and my book: Sandlot Stats: Learning Statistics with Baseball. I have a chapter in my book devoted to a mathematical formula I developed to compare various batting streaks. Using the batting statistics of a ballplayer for a given year my formula assigns a probability of that player achieving his batting streak. Of course the most famous batting streak belongs to Joe DiMaggio when in 1941 he had a 56-game hitting streak. In 1956 Dale Long had his most productive year. In that year playing for the Pirates he batted 263 with 27 home runs and 91 RBIs. During that year he had a streak of hitting a home run in eight consecutive games which broke the previous record of 6 consecutive games held by five players including Mays and Gehrig. Later on Don Mattingly in 1987 and Ken Griffey in 1993 matched Dale Long’s streak. Using my formula the probability of Joe DiMaggio accomplishing his streak was 1 in 10,000; whereas, the probability of Dale Long’s streak was 1 in 12,500. This comparison shows Long’s streak was a rarer event than DiMaggio’s streak. Three years ago Dale Long came to my office with a scrapbook showing how the newspapers covered his grandfather’s streak. The newspaper articles had turned yellow but the words were powerful. Dale Long provided me with interesting stories about his grandfather. These stories I wrote about in my blog dated December, 2012. That blog is archived and you can pull it up and read these fascinating stories. One story is worth repeating. 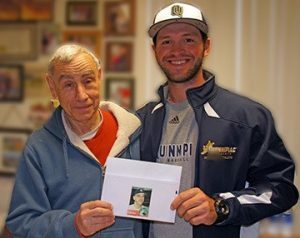 According to Dale Long, when his grandfather signed with the Yankees in 1960 Casey Stengel, the Yankees manager, said to Dale you will have three jobs with us. They are you will play first base occasionally, you will pinch hit, and whenever Mickey Mantle and Whitey Ford go to the city you will go with them and keep them out of trouble. I had Dale come to my office last month. He is now graduating and plans to attend medical school. He told me his grandfather’s full name is Richard Dale Long. His father is also Richard Dale Long. However, his name is Dale Long. He told me he believes his grandfather was one of the first player’s to have an African American roommate. He roomed with Willie Mays. Another story his grandfather told was when he was playing first base Ted Williams hit a line drive at him so hard that the ball hit him on the wrist before he could turn his glove. His grandfather was a heavy smoker and died tragically of Lung Cancer in 1991 four years before his grandson was born.